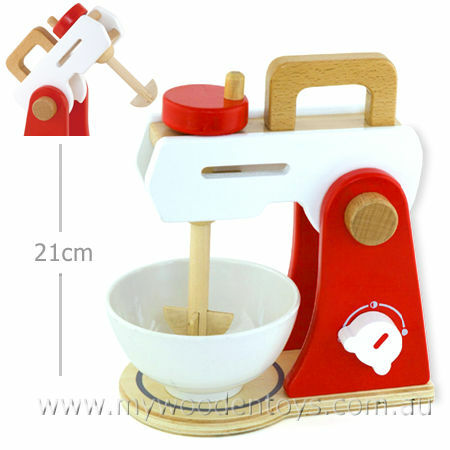 Wooden Toy Kitchen Mixer is a beautiful wooden kitchen accessory toy and a wonderful roleplay toy for all those kitchen adventures. This very sturdy toy comes complete with a plastic bowl and just like the real thing tilts back when you lift the handle. The beater can be turned by moving the big wooden disc on the mixers top. The speed setting knob on the side makes a nice click clack sound as it is turned. We like this because: "Great to find such a sturdy toy in such a lovely colour. "